It is estimated that 60-70% of Australian adults have some form of gum disease, so if you haven’t been brushing and flossing daily and it has been over 6 months since your last professional clean with your dentist, there is a good chance that you do have gum disease. Gum disease is caused by our body’s response to the bacteria naturally found in our mouths. 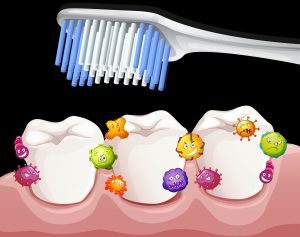 When there are significant numbers of bacteria harbored in large amounts of plaque on our teeth, an immune response is induced to fight the bacteria. Unfortunately, this same protective immune reaction also results in bleeding gums, and over time, gum recession and loss of supporting jaw bone. Ultimately this results in loss of our teeth. The good news is that in most cases, gum disease (also known as periodontal disease) can be managed. The earlier the condition is diagnosed, the simpler and more successful the treatment is. Unfortunately, gum disease cannot be cured as it is the result of bacteria naturally found within our mouths, but it can be controlled with regular dental visits and good home hygiene practices. The earliest stage of gum disease is GINGIVITIS. It is characterised by bleeding gums and you may notice bad breath (halitosis) or a bad taste in your mouth. You might also be aware of a hard yellowish buildup (calculus) behind your lower front teeth and there will usually be harder-to-see areas of plaque and calculus in other areas of your mouth. At this stage the condition is localised to your gums and has not yet affected the jaw bone holding your teeth in place. 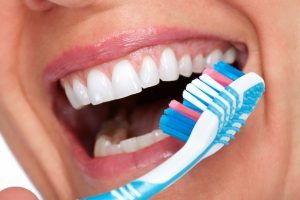 Fortunately, gingivitis is easily managed with a good scale and clean by your dentist every 6 months and by following an effective home hygiene routine including brushing and flossing and other individualised cleaning products or techniques recommended by your dentist. EARLY PERIODONTITIS develops as more plaque and calculus develops and starts to build up under the gum line. On the surface, this stage looks similar to gingivitis however damage to your jaw bone is starting to occur. Dentists can detect this by using a measuring probe between your gum and teeth to determine the depth of your ‘periodontal pockets’. In a healthy mouth, pocket depths measure 1-2mm. In early periodontitis, probing depths commonly measure 3.5-5mm, indicating loss of your jaw bone and swelling of your gums. In most cases, this stage can be treated by your dentist, however cleaning your teeth will take much longer and will be more in depth to ensure your deeper pockets are being accessed. It is possible that you may need to be numbed up to allow this to be done comfortably and effectively. It is vital that you then maintain a regular cleaning routine with your dentist to ensure your home hygiene practices are working and that the disease is not progressing. Your recall time may vary from 3, 4 or 6 months depending on your individual case. Up until now, gum disease is very often painless and you may not even be aware of a problem. As more plaque accumulates and bacteria multiply in deep pockets, the disease continues and you will notice your gums receding away, teeth may be feeling sensitive, feeling lose or becoming sore to chew on. There may be pus oozing from the gums. Acute gum infections can cause swelling and be very painful. Probing depths will now be greater than 6mm and can extend right down the length of your tooth’s root (indicating total loss of bone from around your tooth). Once this occurs, it is likely that your teeth will start needing to be removed or may even fall out on their own. If you have more advanced forms of periodontal disease, it is likely that you will require referral to a PERIODONTIST. This specialised dentist uses specific instruments and advanced techniques to better access and clean the deep pockets around your teeth. If this stage of gum disease is not treated properly it will lead to the loss of more and more teeth and unfortunately this will mean having to consider uncomfortable dentures or expensive implants (if there is even enough bone remaining to support implants). Gum Disease can also increase the risk of serious systemic conditions. Recent studies support an association between active periodontal disease and CARDIOVASCULAR/HEART DISEASE, DIABETES, PRE-TERM OR LOW BIRTH WEIGHT BABIES. So now you know a bit more about gum disease & the causes, you can understand how important it is to come in for your regular 6 monthly examinations & cleans.